Proven dam of color, comformation and disposition.Easy mare to Handle,good momma, easy breeder..Bred to Heza Awesome Dzyn for 2019 foal. 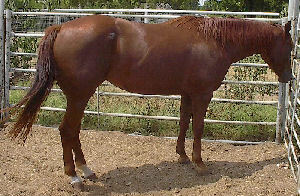 $ 2000..
Exotically Dun,97 APHA red dun overo,15.2,very gentle mare. Gunnin For The Top APHA X Exotic Cowgirl AQHA, Sound To breed,left open for 2018 due to late 2017 "fancy" palomino overo filly, also being offered for sale, $ 1800.. Mare $ 1000 Exposed to Heza Awesome Dzyn for 2020.